Ok, friends, you asked for this one, you got it! 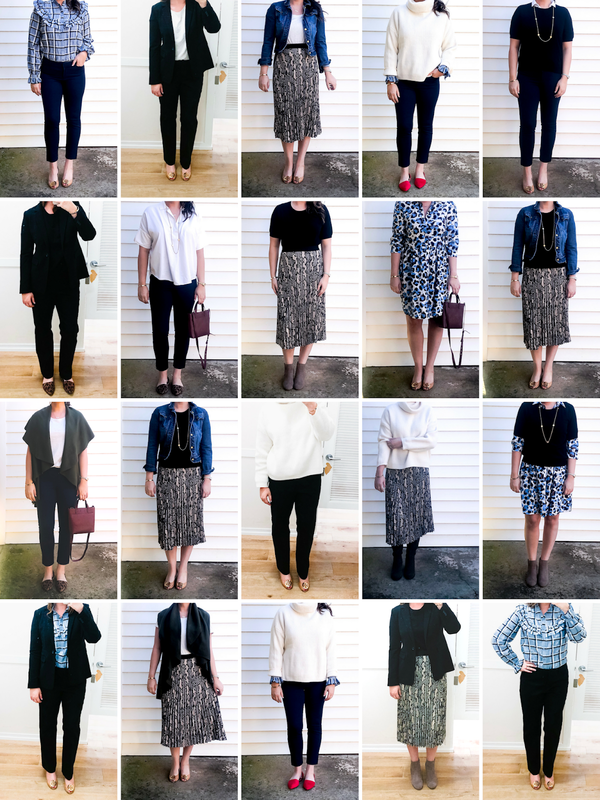 I had so many requests for a Capsule Wardrobe geared toward the nine to fivers that I set out to conquer it, keeping in mind that office dress codes can run the gamut. I've always worked in creative industries or run my own business, so my work wear needs are different than a more traditional office environment. With that said, I think I've found options that can be dressed up or down, will suit a boardroom or an advertising pitch and a few pieces can even go out on a date night. With a total of nine new pieces + two repeat offenders from the Fall Capsule, I came up with 20+ outfits. I pulled a denim jacket, flats, booties and over the knee boots from closet, knowing that you would have basics to work with. If you swap out layering pieces like sweaters and jackets, the outfit combinations become endless. For reference, I'm 5'9", a size 8 in pants and a medium in tops. I love having a slim, ankle length pant in my work wardrobe. I think the silhouette is effortlessly chic and can be paired with just about anything. To balance the Pixie pant, you can't go wrong with a classic black trouser. I made sure the trouser was the same material as my chosen suit jacket so that when a full suit is needed, you're all set. Pairing the wider pant leg with a slimmer fit like the knit tee or tucked in statement blouse will always look pulled together and professional. Probably the most classic item in the Capsule, I made sure that this blazer was free of any unique detailing but had a tailored fit. A black blazer is something I only need one of in my wardrobe so I want it to age gracefully and be ready for me when I need to snag it for a big meeting. I love the price point of this blazer - and the single black button doesn't draw attention to my midsection. The perfect layering piece, I love the shape, neckline and price point of this knit tee. Don't shy away from fun fabrics, patterns or details just because you're at work! This button down is conservative in it's shape but so much more fun than a classic button down. I especially love it layered under the white turtleneck sweater for a pop of color at the wrists. The ultimate basic to pair with everything. Dress it up with the suit jacket and trousers plus a killer pump or rock it on casual Friday with a fun skirt and denim jacket. I've lived in this sweater the past few days and if it's freezing where you are (or in your office! ), you'll want it. It's the best neutral so it plays so well with the more exciting pieces like the patterned skirt and statement blouse. Oh man, do I love this skirt. I wish that I had a pair of black pumps to pair with the skirt + knit tee + blazer combo so you could see her all dressed up, but definitely give this outfit a try. The waist band is elastic so it can be raised to your natural waist and could accommodate a bump if you're rocking one! This skirt also comes in other patterns, just in case you aren't so sure about the snakeskin vibes. Sadly, this exact shirt dress is not available online but this is the closest version to the one I'm wearing. I'm also linking similar options and think that all work wardrobes need a short sleeve and long sleeve shirt dress that can be paired with as many shoe and jacket/sweater options that your closet can handle. 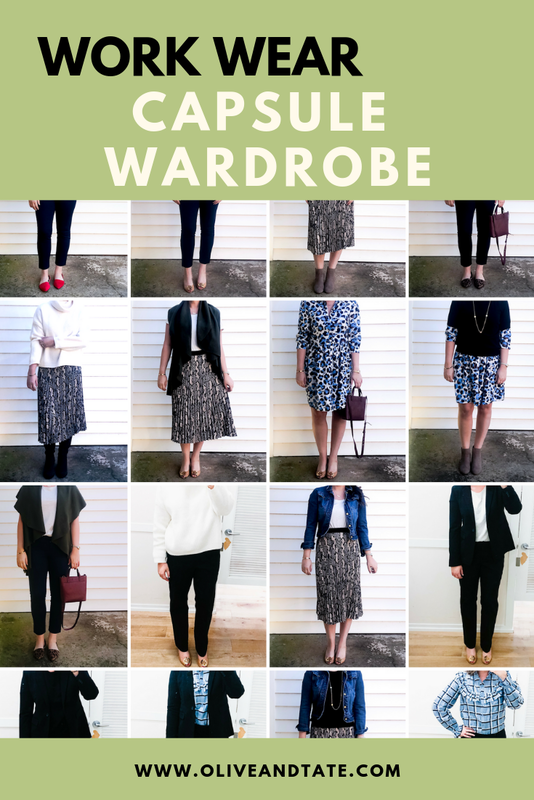 This is such an amazing capsule wardrobe! And do doable for a modern gal!